This is a recipe I found in one of those Hy-Vee magazines they mail to your home. I made it for a recent party at my home. One of my friends called the fresh fruit a bonus to this refreshing sangria drink. Mix all ingredients (except ginger ale) and stir. 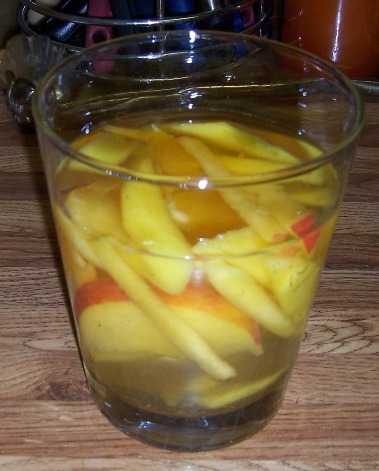 Refrigerate for two hours before adding ginger ale and serving. Makes eight wine sized glasses. Note: This drink has a lot of alcohol so sip slowly. Is this summer heat ever going to break? You know it is bad when 95 feels cool. My sister and nephew came down the end of June. I thought it would be fun to go see Shakespeare in the Park. Unfortunately, the heat was so unbearable ended up going Cosmic Mini-golfing at the Great Mall of the Great Plains instead. Today, I thought I would share a classic recipe from my dad’s sisters. I always thought this recipe was my aunt Joyce’s but just found out it is actually my aunt Linda’s recipe. The first time I ever remember it being made was for Christmas Eve at my Grandma Bourek’s house is Pilger. I remember the slushy looking yummy but I couldn’t have it because it had alcohol in it. Several years later, I would finally be old enough to enjoy this drink at family gatherings. For my Wildtree/Purse Party/Jewelry Party fundraiser, I decided to make this beverage for all our guests. It was at that time I learned how easy it is to make. It makes a lot so make sure you have a ice cream bucket or a That-A-Bowl to freeze it in. 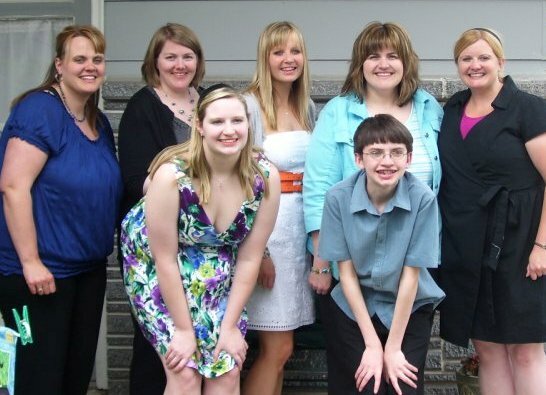 My Bourek side cousins and I at Jodi’s high school graduation in 2010. Mix all ingredients together (except pop) in a ice cream bucket and stir. Freeze for at least 24 hours. Pull out freezer about 30-60 minutes before serving. Use an ice cream scoop to pull out. Add just a splash of pop to each glass and serve. Makes about 20 Solo cup sized drinks. My aunt said you have to use sugar or it doesn’t turn out right. My aunt usually uses vodka. I made it with peach schnapps and I thought it was also good. Remember alcohol doesn’t freeze so you have to have it in this recipe or everything will freeze and could explode all over your freezer. If you cook (even a little), this classic cookbook probably graces your shelves. The Better Homes and Gardens New Cook Book has a red and white check pattern that never changes but the recipes get a face lift on occasion. This recipe teaches you how to make everything from scrambled eggs to lamb shanks. This cookbook staple has some classic recipes that just can’t be made any better. 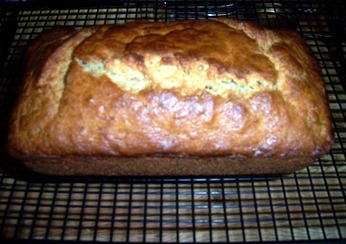 One of my favorites is their recipe for banana bread. The perfect recipe to make with those mushy, black bananas you no longer want to eat. Grease an 8 in. loaf pan. In a large bowl, combine flour, baking soda, baking powder, cinnamon, and 1/8 tsp. salt. In another bowl, mix egg, bananas, sugar, oil, and lemon peel. Add egg mixture to dry mix all at once. Stir until completely mixed (batter should be lumpy). Fold in nuts. Spoon batter into bread pan. Bake at 350 degrees for 50-55 minutes. Test with toothpick to make sure center is cooked. Cool for 10 minutes then move to wire rack. Nutritional facts: (makes 16 servings) 154 calories, 6 g. fat, 1 saturated fat, 13 mg. cholesterol, 75 mg. sodium, 2 g. carbs, 1 g. fiber, 2 g. protein. I don’t use the lemon peel or the nuts. You can use a whole wheat flour to increase fiber. You could also substitute a sugar substitute to decrease fat.